Ayfer Simms takes time out from publishing her debut novel to escape through the dimensions of time and run away with the latest album from Nordic electronica siren Hanne Kolstø. Forever Maybe receives the full customary literary and lyrical review. 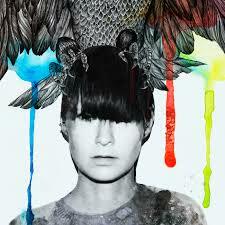 Hanne Kolstø ‘Forever Maybe’ (Jansen Plateproduksjon) Released 19th January 2015. The youth and moody side of the 80s is spilled on a fluid shimmering indie sound of the 90s, with Hanne Kolstø, vocalist who bares the coolness of a Luc Besson female character; carrying about something both fragile and destructive, she is both Nikita’s juvenescence evolving about in the seedy world of secret towns and Leeloo’s innocence and yet powerful inner ability to save the world. She is also Top gun’s sassy instructor: the album has gone to the future and came back, bringing a luminous mix of époques and offering us a hybrid of different atmospheres. It is also Blade Runner and the fate of the Replicant doomed with a short lifespan hiding in the shadows of a cold night. Hanne K, quirky strong persona chants in the streets of a dystopian city, she is made of plastic from the 80s, warmed inside by the distorted and wild guitars of the 90s. The voice of our taciturnly unaware female hero is as accommodating as YOUTH itself wearing a thorn ballet skirt and red runny lipstick, Hanne’s twisted tomboy glare declares “I am alone that’s where I want to be”, “Nothing to talk about” with a provocative shrug, to an audience that will fancy more of this Electronic rhythmic pounding sound layered with smooth catchy pop melodies and synthesizers. The album, Forever Maybe, has the allure of the before dénouement in movies: The pace is placid, whatever dramas cropped up are now cooling off, letting us enjoy the recess of the hero. Hannah is the offspring of a mind, of the Joe Bucks and the Ratso’s of Midnight Cowboys, an atmosphere of hope and gloom, regurgitated and born back in a record: Vintage, rebellion, a bit of selfish indulgence: Agreeable little album.